We have the perfect structures to add the perfect touch to your backyard, patio, or deck. We have arbors & trellises, gazebos, and patio heaters. Arbors & trellises bring a beautiful element to your backyard. Watching the vines grow on a arbor or a trellis is amazing. Arbor and trellis are great to complete your outdoor decor by adding a unique touch. Arbor and trellis are recommended for gardens, but it can be used as a passageway to your desk or patio. 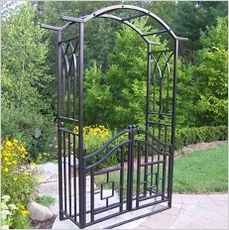 We recommend the Oakland Living Royal Arbor with Gate. It is a great arbor for the passage to your garden. Gazebos are perfect for barbecue�n fun! 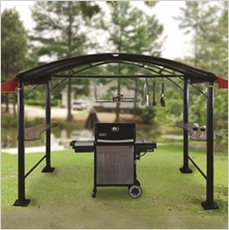 The gazebos from shade trend are grill friendly. If it is raining outside, but you still want ribs on on the barbecue? No problem... get grilling under the shade trends gazebo. There are also decorative gazebos like the Oakland Living Garden Gazebo. This gazebo is perfect to add style to your garden. You can use this gazebo as a lounging place among your backyard or the centerpiece of your garden. Patio heaters are great for those chilly nights that you want to still enjoy in the outdoors. 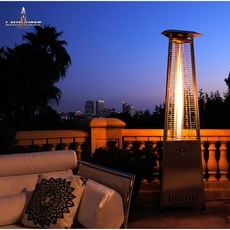 We have a wide selection of patio heaters that are sure to warm you up. We have propane, electric, and lava heat patio heating. Bring your backyard to life with an outdoor structure that is just what you are looking for. Buy your favorite structure and pay zero for shipping. We have free shipping on everything on our website, and we're sure to have everything you need.